This week’s entry for Illustration Friday was a super-quick sketch based on a story concept I had a while back which I have yet to get to. It was drawn on regular-surface bristol paper with a Pitt brush pen, 9×12 inches. I’ve been going through my small-size bristol like crazy lately! This was my last sheet of 9×12, although I have some other types of paper in this size. The tip of the brush pen had gotten a little bit loose and blobby, but I thought it worked here since it’s a relatively rough drawing and the paper’s a little rougher than I’ve been using lately too. My wrist needed the change of pace after working on all those snowflakes, which were inked last week and which I’ve been coloring like mad ever since. Update on that little project to come soon! 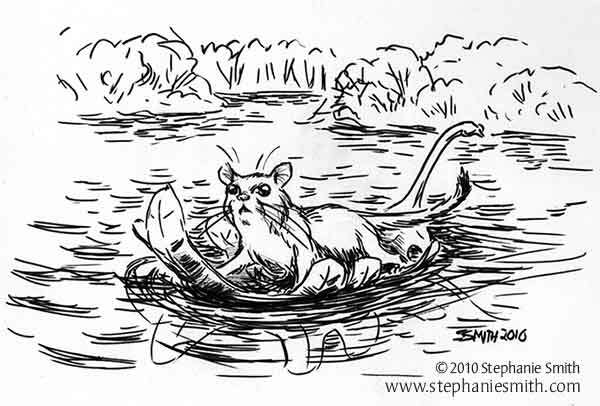 This entry was posted in animal, Illustration Friday, Scribbles by stephanie. Bookmark the permalink.